Your bones and your cartilage are connective tissues that function as the structural support of the body. Chondroblasts are immature chondrocytes found in growing cartilage. 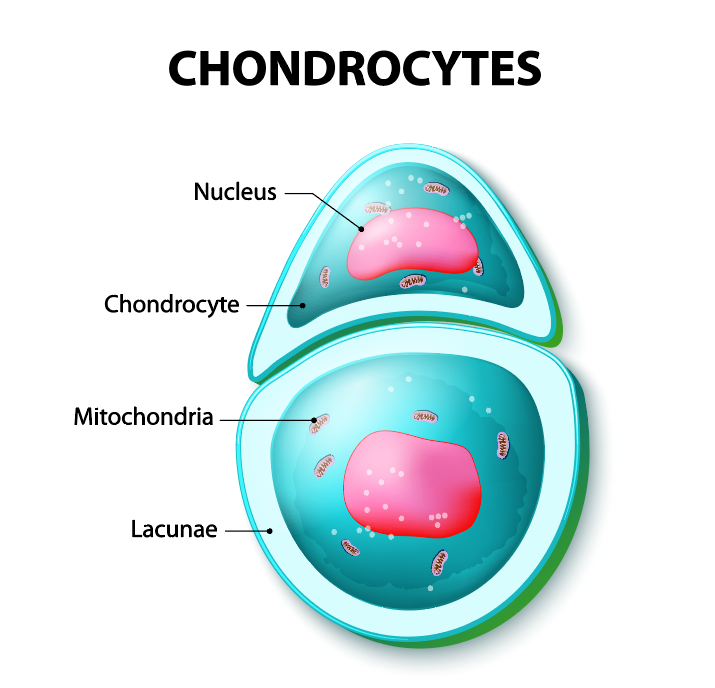 Chondrocytes are the primary cell type of cartilage. These chondrocytes make all of the fibers and ground substance, that together form the matrix of cartilage. The fibers found in the matrix of cartilage include collagen and elastin. These fibers function to cushion and support body structures. The ground substance of cartilage is made up of a gel-like substance that holds large amounts of water, which allows it to act as a cushion. There are three different types of cartilage: elastic (A), hyaline (B), and fibrous (C). In elastic cartilage the cells are closer together creating less intercellular space. Elastic cartilage is found in the external ear flaps and in parts of the larynx. Hyaline cartilage has fewer cells than elastic cartilage; there is more intercellular space. These chondrocytes are found inside small cavities called lacunae. The extracellular matrix contains gel-like ground substance and either collagen and/or elastin fibers. ​Cartilage is mainly (~80%) water. 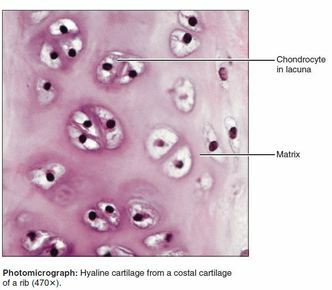 ​Cartilage is a connective tissue consisting of chondrocytes and a matrix of collagen fibers and elastic fibers within a water-rich, gel-like ground substance. 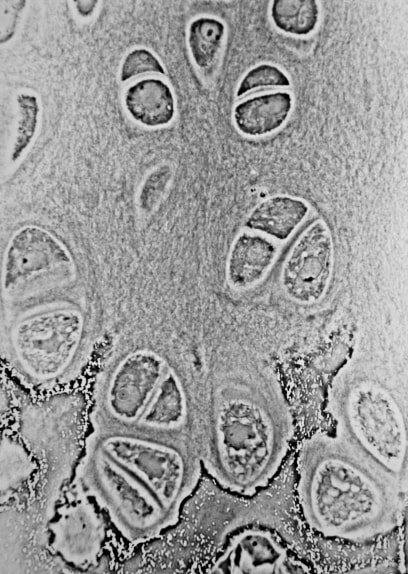 The matrix is produced by chondroblasts (immature chondrocytes). Cartilage does not contain blood vessels or nerves except for the area of the perichondrium. The perichondrium contains the blood vessels which provide nutrients to the cartilage. Nutrients diffuse from the perichondrium, through the matrix, to reach the cartilage cells. Since diffusion is limited over great distances, the cartilage must remain relatively thin. ​Embryonic Skeleton - ​​​In development, the embryonic skeleton is mostly hyaline cartilage that later develops into bone. Some of this embryonic hyaline cartilage persists throughout childhood and adolescence. This hyaline cartilage can be seen as the epiphyseal plates or lines (commonly called the growth plates) at the ends of long bones that mark where the growth is occurring. Elastic cartilages are similar to hyaline cartilages, with the exception of the addition of elastin fibers to the extracellular matrix. Because of these additional elastin fibers, elastic cartilage has the added ability to stretch and is better able to withstand repetitive bending. 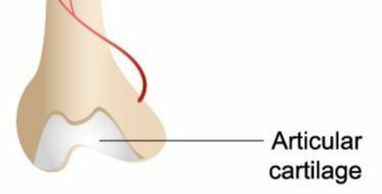 Elastic cartilage is the most rare form of cartilage and is found only in the external ear and the epiglottis. The epiglottis is the flap that folds down and closes off the opening to the trachea when we swallow, in an effort to prevent food from entering the airways by mistake. This gif shows the action of the epiglottis. When a person swallows, the epiglottis is positioned over the opening to the trachea to prevent food from entering the airways. Fibrocartilage is the strongest cartilage in our bodies is fibrocartilage. It is highly resistant to compression and has high tensile strength. 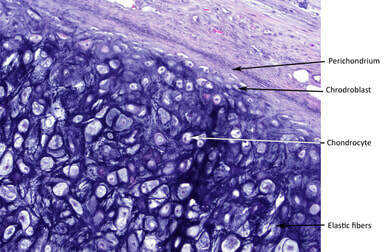 Fibrocartilage contains parallel rows of alternating chondrocytes with thick collagen fibers. This type of cartilage is found in areas of our body that undergo a lot of mechanical stress due to compression and tension forces, like our knee joints and invertebral discs. 1) In appositional growth (ap″ozish′un-al), cartilage-forming cells in the surrounding perichondrium secrete new matrix against the external face of the existing cartilage tissue. 2) In interstitial growth (in″ter-stish′al), the lacunae-bound chondrocytes divide and secrete new matrix, expanding the cartilage from within. Why do we develop a skeleton made out of cartilage first? Our skeleton begins as cartilage. This is because the matrix of bone is hardened and calcified. 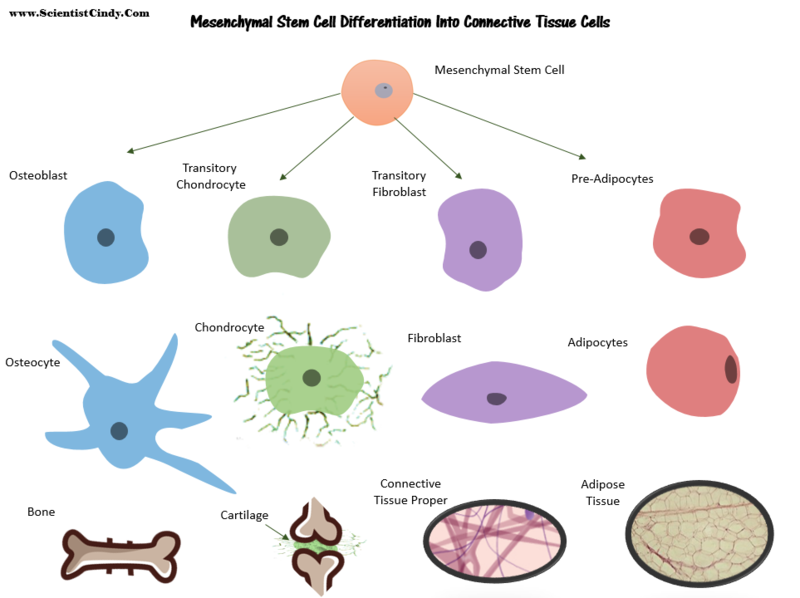 Unlike the matrix of bone, the matrix of cartilage is a gel-like substance that allows for mitosis to occur. Cartilage has a flexible matrix that can accommodate mitosis. It is the ideal tissue to use to rapidly lay down the embryonic skeleton and to provide for new skeletal growth. During fetal development, the chondrocytes of cartilage become ossified and the matrix becomes calcified forming bone. Early in gestation, a fetus has a skeleton made out of cartilaginous tissue. The long bones and most other bones gradually change from cartilage to bone. This process continues well after birth, lasting through the first few years of life. This process is known as endochondral ossification. ​Ossification or osteogenesis is the process of laying new bone material by cells called osteoblasts. At birth, a newborn baby has over 300 bones, while on average an adult human has 206 bones. Ossification or osteogenesis is the process of generating new bone material by precursor cells called osteoblasts. Two processes result in the formation of normal, healthy bone tissue: intramembranous ossification and endochondral ossification. 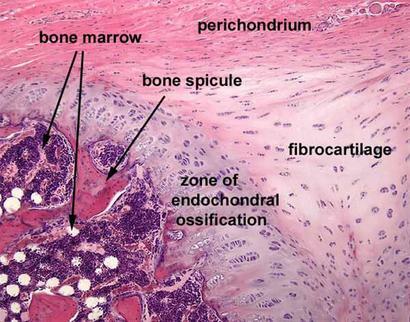 Intramembranous ossification is the direct laying of bone into the primitive connective tissue (mesenchyme). The membrane that occupies the place of the future bone resembles connective tissue and ultimately forms the periosteum. It is composed of fibers and granular cells in a matrix. Endochondral ossification involves cartilage which is then mineralized. Bones are dynamic structures that respond to applied force over time. With chronic weight bearing and the forces from daily use and movement, bone mass can be maintained or increased.